FIRST: Make a list of the dishes you would like to make. We did macaroni and cheese, lasagna, Reuben style shepherd’s pie filling, beef stew minus the potatoes, grilled chicken breast, whole roasted chicken, ground beef seasoned with onions, salt and pepper,and breakfast burritos. Keep reading for the recipes. SECOND: Make a grocery list. You’ll want to decide how many of each thing you want to make. 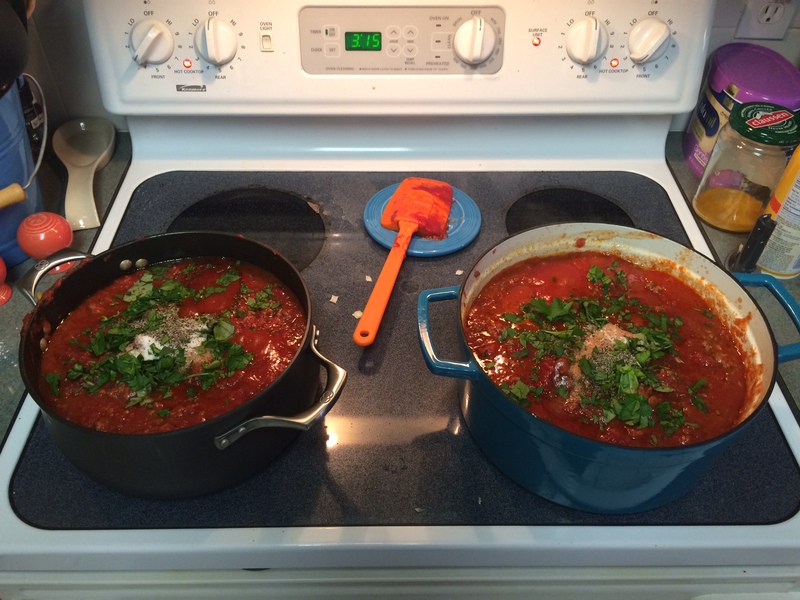 For example, we made a triple recipe of beef stew so each of us could take one. On my grocery list, I wrote “stew meat- 3 pkg” so that I would know to buy for three recipes. It gets trickier if you have an ingredient that you’ll be using in more than one recipe. I knew that we would be using ground beef in our lasagna, the shepherd’s pie filling and I wanted some just by itself. I had to make sure to add all of the amounts together and write that down. I think I ended up buying 15 pounds of ground beef! Also be sure to include storage containers on your list. Think about each dish you are making and how it should be stored. Most things on my list above were stored in zipper-top freezer bags, but some will go directly to the oven, so I put them in aluminum foil loaf pans and covered them with heavy duty foil. There are also plastic freezer containers you can buy if you would rather use those. You also might want to pick up some snacks, drinks, or convenience items to have while you are cooking. You’ll get hungry and thirsty but every pot, pan, and dish you own will be in use or dirty! Plus after all that cooking and freezing, you won’t feel like cooking dinner that night! THIRD: Shopping. You’ll probably be buying a lot of stuff. Take someone to help you and be sure to take insulated grocery bags and/or an ice chest to keep all of your perishables cold on the drive home. Stay focused in the store, so that you don’t overspend on items you don’t really need. FOURTH: Set aside at least one whole day, maybe a day and a half, to do nothing but cook and clean. I think we had 4 rounds of using and washing my three big 6 quart pots, both of my 9×13 in cake pans and all my good knives. Not to mention spoons, cutting boards and mixing bowls. Give your food ample time (about an hour) to cool down before putting it in the freezer. 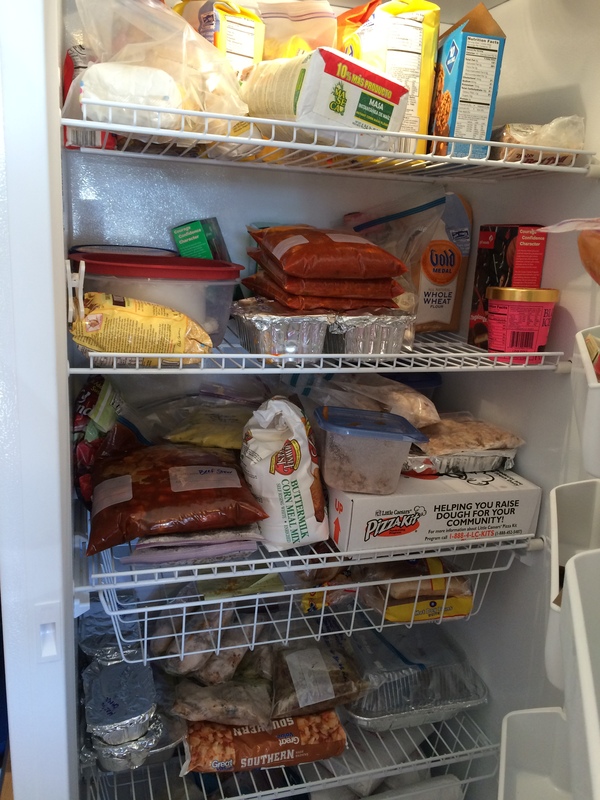 You don’t want to raise the temperature in the freezer so much that everything else thaws! 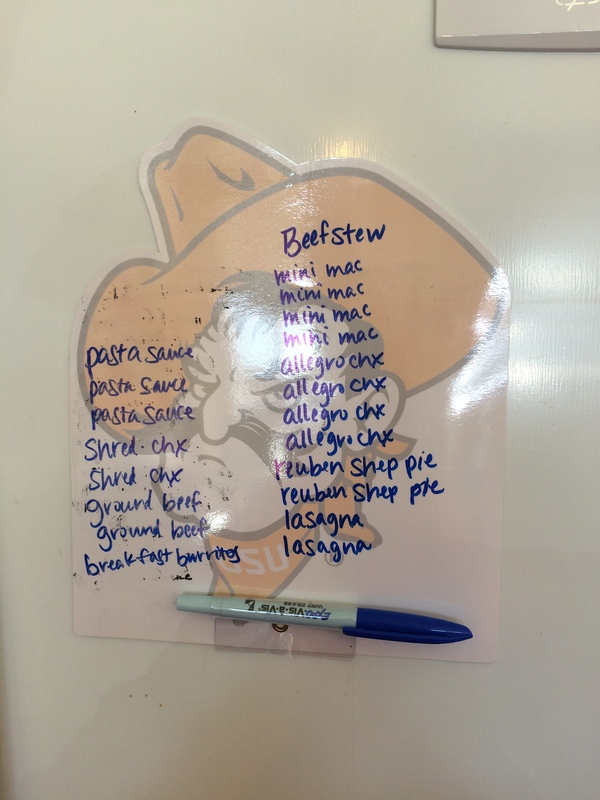 FIFTH: Make a list of all the wonderful meals you have on hand and place that on your freezer door. I used a magnetic dry-erase sheet and a wet-erase pen. I had a dry erase marker for a while, but they dry out so fast. I figured my wet-erase would work for now. I can cross off items as they are used and when everything is gone, I’ll clean it with a wet paper towel. I marinated and grilled 2 large packages of chicken breast. 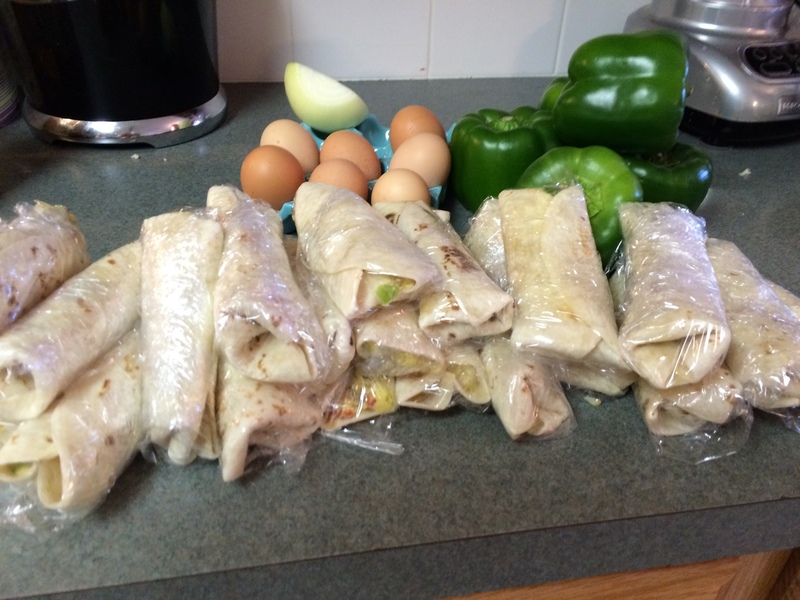 Once cooled, I cut it into strips (like for fajitas) and packaged them 2 breasts to a quart size bag. I added in some sauteed peppers and onions and froze. When I’m ready to eat them, I will just thaw over night in the fridge and heat in the microwave. I let 2 whole chickens cook away in my slow-cooker for 6 hours on low. Once cooked, my dear sister de-boned and shredded them. We divided the chicken up into 9 quart size baggies, each taking three. This can be thawed in the fridge and used for soups, casseroles, or tacos. We also browned some ground beef with diced onion, salt and pepper. We packaged up several one-pound portions in quart size bags and froze those for to use for pasta sauce, tacos, casseroles, or anything else you might need ground beef for! Brown the sausage in a large skillet and drain excess fat. Add in onions and bell peppers, cooking until tender. Add in eggs and scramble. Toss cheese in and let it melt. You may want a little more or a little less cheese. Just whatever you prefer. 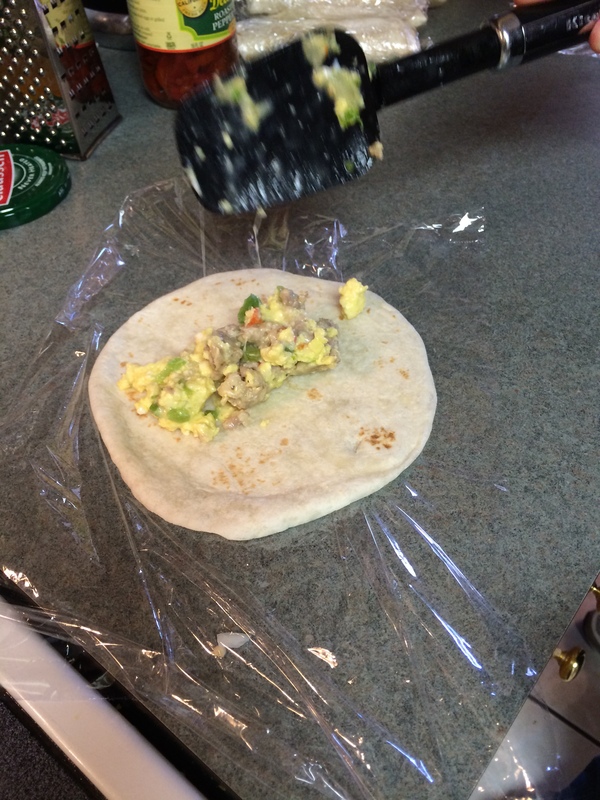 Place one serving spoon full of egg/sausage mixture down the middle of a tortilla, tuck one end up and roll. Then roll in plastic wrap and place in a freezer bag. 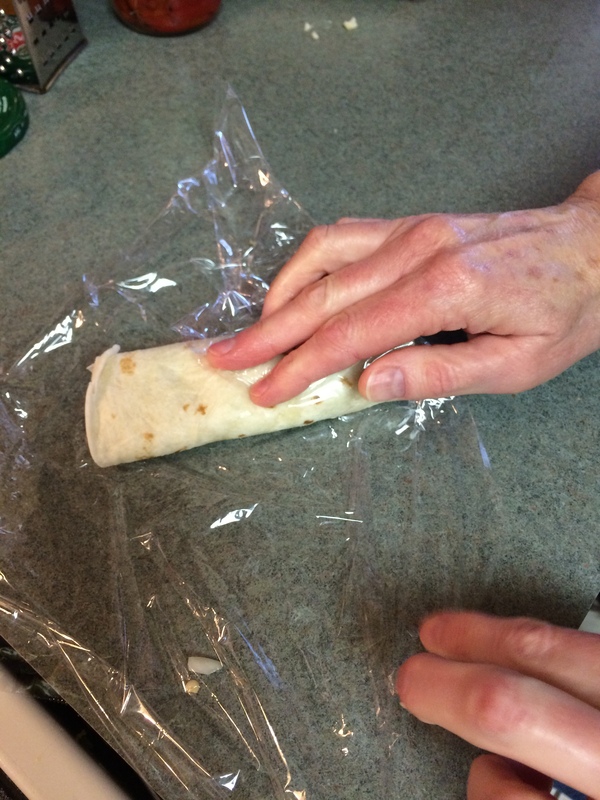 When you are ready eat, take it out of the plastic, wrap in a paper towel and microwave for 1 1/2 to 2 minutes. Cook macaroni in boiling water until al dente. Drain and set aside. Melt the butter in a medium saucepan, add in onions and saute until soft. Whisk in flour, salt and pepper. Whisk 3-4 minutes to make sure you wont taste raw flour. Whisk in mustard until combined. Whisk in milk and stir until sauce gets thick and bubbly. 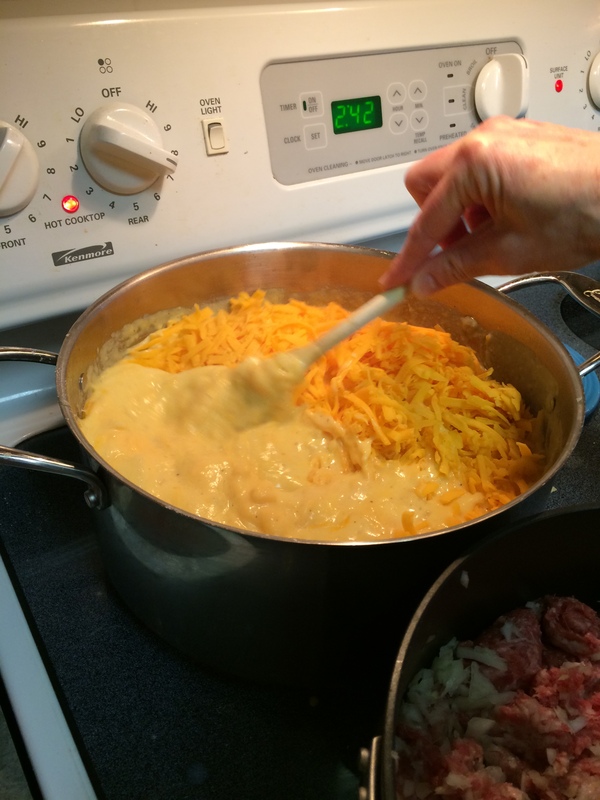 Add in cheese and stir until cheese is melted and sauce is smooth. Add in macaroni noodles and stir to combine. At this point dish your macaroni into desired containers. I use disposable mini loaf pans. This size is perfect for my little family of 3 “solid food eaters.” You could use a pan big enough for the entire recipe, or break it up like I do. Place bread in a mixing bowl with Parmesan cheese and pour butter over the top. Mix with your hands to make sure the bread has soaked up the butter and is coated with cheese. Top the macaroni pans with this bread. Cover with foil and freeze. When you are ready, let the macaroni thaw in the refrigerator for a couple days, then bake at 350 until it is hot and bubbly, and the bread topping is nice and toasted. This photo is of the meat browning process. Heat oil and butter in a large pot over medium-high heat. Salt and pepper your meat, then sear it in hot oil. You want a nice brown color on the outside, but meat does not need to be cooked through at this point. It’s best if it is not. Remove meat from pan. Throw onions and carrots into the pan and cook until they are starting to soften. Stir to get all of the meat bits off the bottom of the pan and get a little color on the vegetables. Add in tomato paste and stir. 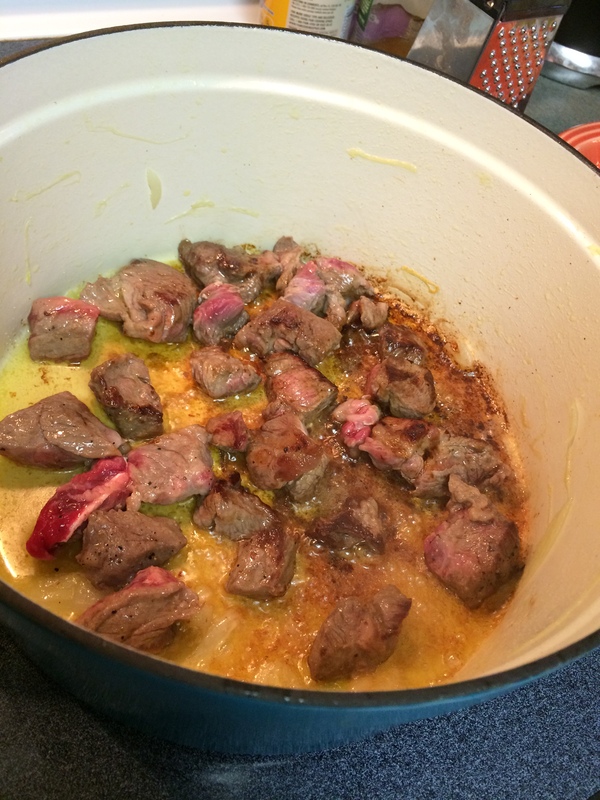 Pour in beef broth, add meat back in. Put a lid on your pan and let it simmer for 2-3 hours. Cool the stew down, then place in gallon size zip-top freezer bag. Lay flat in the freezer. When you want it, let it thaw and reheat on the stovetop. Serve over mashed potatoes. ** I do it with the potatoes mashed for two reasons. The first is my husband likes it that way. The second is that potatoes do not freeze well. If you had larger chunks of potato in your stew when you froze it, the texture would be very unpleasant upon reheating. Let thaw 2 days in the fridge. Preheat oven to 375 degrees F (190 degrees C). Bake in preheated oven for 25 minutes. Remove foil, and bake an additional 25 minutes. Cool for 15 minutes before serving. This is modified from Rachael Ray’s recipe. She uses a “smashed potato” topper, while I like traditional mashed potatoes. Heat the olive oil in a large Dutch oven over medium-high heat. Add the corned beef and cook until browned, and then remove to a plate. Add the ground beef and cook until browned. Add the garlic, celery, bay leaf, carrots and onions and season with salt and pepper. Cook until the vegetables are soft, about 5 minutes. Return the corned beef to the skillet. Heat the butter in a small skillet or sauce pan over medium heat. Whisk in the flour and cook, whisking, until light golden. Whisk in the beer, Worcestershire, mustard and consomme; season with pepper. Remove the bay leaf. Pour the gravy over the corned beef mixture and stir to combine. Once cooled, transfer to a freezer container of your choice and freeze. To serve, thaw and pour into a casserole dish. Top with sauerkraut, grated Swiss and cheddar cheeses, and mashed potatoes. Bake in a 400 degree oven until heated through- about 30 minutes. Love reading your blogs! They are always awesome and helpful!